Who Better To Celebrate Christmas With Than Bad Religion? Esteemed punk legends Bad Religion performed their version of O Come, O Come Emmanuel, from their newest album Christmas Songs, last week on Conan. Bad Religion’s well-received Christmas album, Christmas Songs, was released earlier this year on Epitaph. 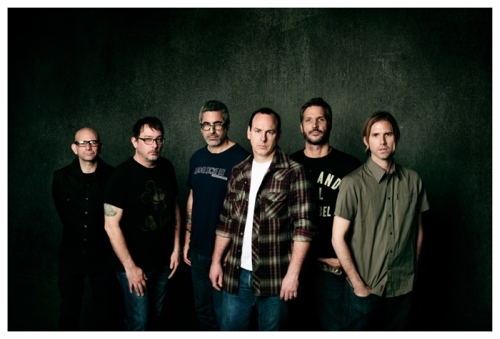 In January the band also released their 16th studio album, True North, making 2013 a monumental year of two special Bad Religion records. This week, Christmas Songs came in at number seven on the Billboard Hard Rock chart and number 17 on the Billboard Independent Album chart. And in the true spirit of giving, 20% of proceeds from Christmas Songs will be donated to SNAP, Survivors Network of Those Abused by Priests. Additionally, Bad Religion has bestowed daily “gifts” to fans, via their own Bad Religion advent calendar, launched on December 1. Fans are encouraged to visit the site badreligion.com to “unlock” daily reveals. Gifts have included free track downloads, merchandise coupons, a holiday card generator and the most popular gift – a per click donation from Bad Religion to a food bank, generating approximately $10k for charity, crashing the site and seeing the band at number one on Reddit.com for the day. Co-songwriter and guitarist Brett Gurewitz calls Christmas Songs the, “…most subversive album we’ve done”. While co-songwriter and vocalist Greg Graffin got his start singing in grade school and has a personal connection to these songs. Listen to Gurewitz and Graffin talk about Christmas Songs on NPR Weekend Edition with host Rachel Martin here. In a world still brimming with rampant anti-intellectualism, inequality and oppression, Bad Religion’s signature brand of sonically charged humanist dissent is as relevant as ever. And this Christmas season, just a little more ironic. Fans are invited to order the album, just in time for holidays by visiting iTunes or badreligionstore.com. Kicking off the holiday season a little early, Bad Religion’s Christmas Songs is out now and streaming in its entirety at YouTube. Throw a yule log on the fire and listen to Bad Religion’s Christmas Songs. Bad Religion will contribute 20% of proceeds from Christmas Songs to SNAP, Survivors Network of those Abused by Priests. For more information visit: http://www.snapnetwork.org/. The band’s iconic vocalist and co-songwriter, Greg Graffin has a personal connection with these songs. Graffin got his start as a singer when he was young boy in a church choir. His instructors found him so remarkable that he received a scholarship to a choir school. And thus, the voice of Bad Religion was born. In a world still brimming with rampant anti-intellectualism, inequality and oppression, Bad Religion’s signature brand of sonically charged humanist dissent is as relevant as ever and this Christmas season, just a little more ironic. Fans are invited to order Christmas Songs by visiting:www.badreligionstore.com. Revered punk rock legends Bad Religion are releasing a Christmas album, Christmas Songs, on October 29. Christmas Songs features eight new studio recordings of traditional Christmas hymns and an alternate mix of their single American Jesus by Andy Wallace. To get their fans into the holiday spirit (said in a sarcastic way), Bad Religion have unveiled O Come, O Come Emmanuel taken from the Christmas Songs album which will be released at the end of this month. Bad Religion will contribute 20% of proceeds from Christmas Songs to SNAP, Survivors Network of those Abused by Priests. For more information visit:http://www.snapnetwork.org/. Co-songwriter and guitarist Brett Gurewitz said: “This might be the most subversive album we’ve done. To me, what the album is indirectly stating is that this music, and thus the world, can be powerful and beautiful stripped of god and religion. The band’s iconic vocalist and co-songwriter, Greg Graffin has a personal connection with these songs. Graffin got his start as a singer when he was a young boy in a church choir. His instructors found him so remarkable that he received a scholarship to a choir school. And thus, the voice of Bad Religion was born. Fans are invited to pre-order the album by visiting www.badreligionstore.com. Bad Religion is set to release a Christmas album, Christmas Songs, on 29 October. Who better to help you celebrate that most wonderful time of the year? Bad Religion have threatened to record an album of seasonal classics for years and now they have actually gone and done it. Tackling eight chestnuts in their classic punk rock style, Christmas Songs features White Christmas with its nod to pioneers The Ramones, the glorious choirboy intro to Hark! The Herald Angels Sing, O Come All Ye Faithful, God Rest Ye Merry Gentlemen among other popular and traditional Christmas Songs. Nothing says Christmas like Bad Religion.